Brussels SofAlert today introduced a new system for cyclists to warn dangerous traffic situations. 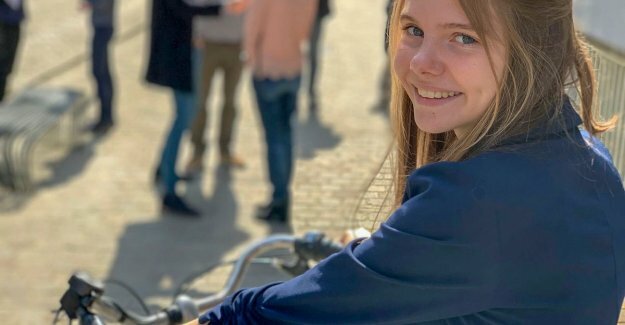 The system is designed by the friends of Sofie De Ridder (12), which three years ago was killed in an accident with a truck. 25 students of the Maria-Boodschaplyceum and trucks of the Brussels Environment in the period of testing. Sofie died three years ago at a dodehoekongeval with a truck in Eppegem. Her friends Kato, Jente and Eline came then on the idea of a ‘dodehoekmelder’ to develop which can be used on the bike. “We saw all the sadness and found that it doesn't happen again,” says Kato (15), the friend of Sofie. They have participated in a contest and won the “Hole in the Market”price. Kato and her parents, Els Dauwe and Peter Reynaert, than continuing with the development of the project. So is SofAlert arise, called to Sofie. They want cyclists to better inform for verkeersgevaar.